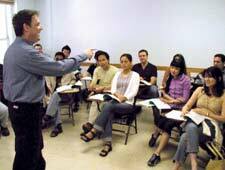 Course In Spoken English For Housewives is an event that took place between 14-Aug-2006 and 08-Sep-2006 in Hyderabad. Ever felt the need for your wife or your mother to pick up some English skills? Well, here's an opportunity coming their way. In this fast paced world where the western influence is gaining popularity and English is taking the place of global language, the importance of spoken english cannot be ruled out. The Literacy House Andhra Mahila Sabha announces a 4 week course in Spoken English for House wives. The course aims at providing error-free spoken english, which includes functional grammer, speech practise, role play, groups discussions, public speaking, emotional intelligence, time management and self motivation. This course is being conducted for house wives to make them equipped to conduct themselves in various situations in their day to day works. Please contact Swarna Durga at 2709-8406, 2709-6464 for further details. Be the first to comment on Course In Spoken English For Housewives! Just use the simple form below. fullhyd.com has 700,000+ monthly visits. Tell Hyderabad what you feel about Course In Spoken English For Housewives!